Despite periods of volatility, the crypto investment market is growing, with hundreds of exchanges trading and converting different currencies. Mainstream companies are even beginning to accept Bitcoin and other cryptocurrencies as forms of payment. Janina Lowisz, VP of Marketing at Cashaa, told us how the company is providing accounts to businesses in the crypto sphere. But, for exchanges, brokers, and other startups and enterprises using cryptocurrency, and entrepreneurs and businesses looking to incorporate crypto into their operations, access to financial services offered by traditional banks is nonexistent. Banks tend to avoid involvement with cryptocurrency because of the cryptomarket’s volatility, the lack of tools and frameworks to ensure crypto transactions are compliant, as well as regulatory uncertainty. Today, global crypto-friendly banking platform Cashaa gives businesses an easy yet secure and compliant way to move easily between crypto and fiat currencies. The Cashaa advantage is that it provides one account for old and new money. Acting as a bridge between fiat and digital currencies, Cashaa helps businesses access both and expand their opportunities. “All is included in one account, easily manageable, instantly convertible, with different account plans suitable for your needs,” Lowisz said. The updated three plans (Start, Standard, and Advance) will be available this April. With the Start plan, businesses can add crypto into their business activities, accepting crypto payments in a secure, easy, and compliant way, with a limit of up to 1 Million GBP of crypto conversion, deposits and withdrawals in 200 countries, and all without any monthly fee. Cashaa’s Standard plan comes with a full U.K. current account, secure cryptocurrency storage, single-click conversion between crypto and fiat, as well as a Mastercard linked to the operational account. This plan includes tiered pricing which is more affordable compared to challenger banks, starting from 100 GBP per month. Cashaa Founder and CEO Kumar Gaurav at Blockchain Summit India 2019. Whereas both these plans are recommended for existing businesses as a fast way to start accepting cryptocurrencies, the Advance plan is specifically for crypto businesses. The Advance plan also comes with tiered pricing to be as inclusive as possible for both small and larger companies. Whether you are a startup that wants to do a token sale or an established exchange, you get all your banking needs covered with a U.K. current account integrated for international and local payments with Mastercard. Cashaa says that crypto-related businesses are underserved by banks, and the company’s goal is to create a hassle-free experience for STO- or ICO backed companies, exchanges, wallets, and brokers. The Cashaa Multi-Sig Compliance (CMC) Wallet, which beta-launched with CAS token deposits last November, is included in all Cashaa plans and includes advanced security and compliance features. Central to the CMC Wallet’s security is its three-key, multi-signature architecture that protects user data in the event the user’s password is lost. 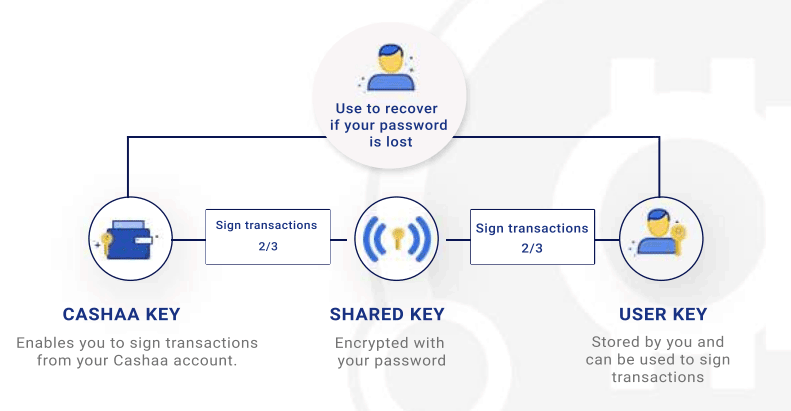 Transactions require a private key stored by the user, a Cashaa key, and a shared key encrypted with the user’s password. As for compliance, the wallet contains anti-money laundering and fraud-detection features that analyze transaction patterns using risk indicators, behavioral analysis, and data science techniques to warn against suspicious transactions, protecting against business discontinuity and legal exposure. The wallet is integrated with leading crypto exchanges and OTC pools to ensure the best prices and availability to buy and sell. In addition to its own CAS token, Cashaa includes BTC and ETH in its wallet and plans to quickly onboard other currencies in the coming months. Cashaa also provides Wallet and Trading APIs that enable businesses to integrate the wallet and exchange capabilities into their own business. All from a small but experienced team of people based in Mumbai and London. “The journey has been especially exciting over the past weeks, since the Supreme Court gave a 4-weeks deadline to the Government to come up with a cryptocurrency regulation. We are expecting a huge influx of new users from India once it is open to cryptocurrency,” Lowisz said.